Unfortunately for pet owners, the your pet door is a convenient access to the home for more than just your cat or dog. To potential burglars, this door is also an opportunity to access the home. They might not fit through the door itself, of course, but they can stick their heads through to get a better understanding of the space, fit tools through the gap, or even widen the door without too much trouble. Worse still, the area outside a door with a pet access flap is often fully fenced, in order to prevent the pet from roaming away from the home. This gives would-be thieves the privacy they need to do their work. So how can you prevent your pet door from becoming a home security liability? Thankfully, the people that produce these doors realise the risks themselves, and by combining their innovation with some clever ideas of your own, you can make that pet door a downright intimidating task for even the most dedicated burglar. 1. Don’t install the doggie door in a door. If possible, install the doggie door in a wall, rather than a door. Doing this will prevent a burglar from being able to use the flap to reach the interior locks of the door itself. Additionally, buy the right sized door for your pet, and position it properly – it should be installed to the height of your pet’s back, and the width should only measure to your pet’s shoulder width. That way, if a burglar does try to use the door themselves they’re in for a very uncomfortable experience – and a compromising one, if neighbours or other pedestrians should spot them in the act. Modern pet doors can come with electronic locks that require an RFID chip to unlock, which can be conveniently installed on the dog or cat’s collar. What this means is when the pet wants to use the door it will automatically unlock for them when they approach, but not for a burglar. These doors are more expensive than standard flaps, but they are so intuitive they’re really essential to the modern pet-owning family. Another technological solution is to get the pet door alarmed. To do this, gauge the weight of the pet, and then install sensors that will trip if anything significantly over that weight moves through the door. 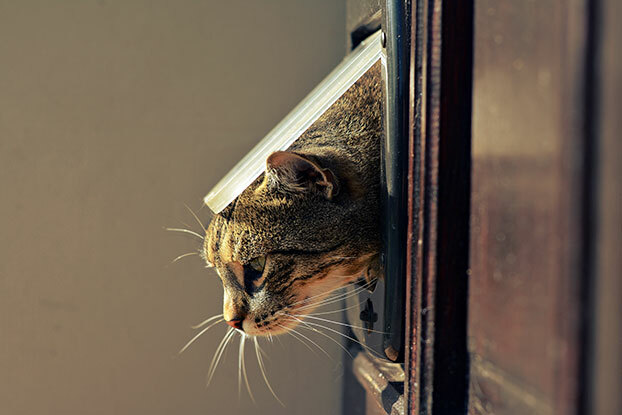 This solution has the added benefit of letting you know when other undesirables, other than burglars, enter the home – such as other cats, dogs, or pests. Beyond upgrading the door itself, there are a couple of things you can do to the pet door to help deter intruders. As mentioned previously, pet doors are often attractive to thieves because they are very often located in areas in which they can act in privacy. One way to fix this is to install motion sensing lights in the area around the pet door. Unwanted nighttime visitors will usually be scared off by this, as it significantly increases the chances of them being seen. Even more effective than motion sensing lights (though they’re most effective when used in conjunction) are security cameras. Installing these will immediately make thieves feel watched, and are one of the best ways you can deter burglars from breaking into your home. If you’re running on a budget, you can also consider fake security cameras. These are devices that look like real security cameras, but don’t actually record any information. The better ones even have lights to suggest that they’re on. If you can install one on the outside of your home overlooking the pet door, the typical burglar won’t know the difference – and won’t be hanging around to find out in any case! Another little mind game you can play with burglars is to install some timers to the light switches in the room your pet door leads to. That way, even when you’re not at home, at designated intervals (which with most timers you’re able to set yourself) you’ll be able to have the lights switching on and off, giving the impression that your home is occupied. There is, of course, no way to completely guarantee the security of any home, and a pet door is certainly something that compromises the security of your personal space. However, by executing common sense and following the above guidelines, it’s entirely possible to make the pet door as difficult to break through as any other entrance to the building.